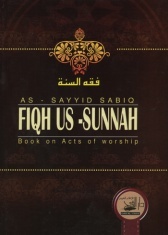 "This book deals with the fiqh questions and provides supporting evidence to them form the clear Book (of Allah), the authentic sunnah of the Prophet, upon whom be peace, and what this ummah has agreed upon. In dealing with the subject, I have recorded what is basic, to the point, and what a muslim is supposed to know. I have kept myself away from controversial points except where differences re permissible. I have referred to the varing opinions among the scholars. I say with confidence that i have presented the authentic fiqh which Allah has sent to the Prophet with. At the same time, I have tried to make it easier for the people to understand and to bring them together upon the Book and sunnah. I have avoided the differences and the wrong practice of blindly sticking to the school of thought. I have also desisted from following the nonsensical statement that the door to itjihad is closed..."